Every year I cook a ham for Christmas Eve dinner. Every year I suggest trying a new recipe, and every year my family beg me to do this recipe again. They call it it the Best Ever Christmas Ham! 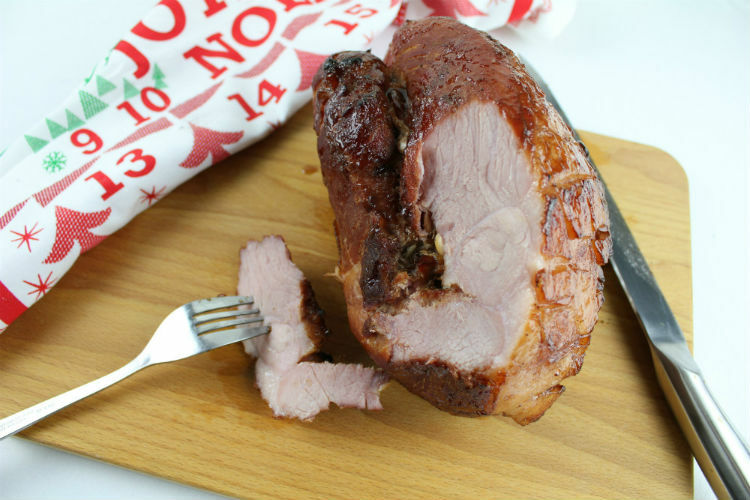 My recipe for a Christmas Ham is perfect to cook on Christmas Eve, and gives delicious results every time! * indicates affiliate links – this site receives a small fee from purchases made through these links. Please view the disclosure policy for more details. My Christmas Ham recipe is based upon the Fully Festive Ham in Nigella Lawson’s ‘Feast’*. I’ve tried the Delia Smith Christmas Ham recipe, and a baked ham recipe from Gary Rhodes, but this is definitely my favourite. When I cook it on Christmas Eve, I usually use a huge 3.5kg joint of meat. I’ve scaled things back a bit for this recipe, but I’ll add in the cooking times for the bigger joint as well. This recipe is deliciously sweet, tender and very moreish. When I start cooking it on Christmas Eve, the house fills with the scent of fruit and spices and Christmas has officially begun. I usually cook it in two stages so I simmer the ham in the morning, let it cool and then finish it off in the oven at dinner time. You can either do this or complete both stages straight after each other. I serve the Christmas Ham with either creamy mashed potatoes (Ollie’s choice) or a gooey macaroni cheese (Lyle’s choice). Sometimes both if the boys ask me really nicely! I add some crunchy steamed veg to the table as well, for contrast. The leftovers easily get used up over the next few days. I use them in sandwiches, pasta dishes, bubble & squeak or my personal favourite – just cutting a slice off and eating it while standing at the fridge door! This is perfect to cook on Christmas Eve - serve it with mashed potato or macaroni and some crunchy veg alongside. You'll have plenty of leftovers to see you through the festive period! Most hams don't need soaking, as production methods have changed meaning the meat isn't as salty any more. If you want to be really sure, you can soak the ham overnight in cold water. Alternatively, put the ham in a large saucepan that it fits in snugly, and cover the ham with cold water. Bring to the boil then drain the water away and rinse the ham. Rinse out the saucepan and put the ham back in it. Cut the onion in half, trim the root end and remove the very papery outer layers - you don't want to peel the whole thing. Add the onion and the spices to the saucepan with the ham. Mix together the apple juice and cranberry juice and pour it into the saucepan to cover the ham. If you need more liquid, some add cold water. Part cover the pan and bring it up to the boil, then turn down to a gentle simmer. Cook the ham for 30 minutes per 0.5kg, so a 2kg ham will take around 2 hours to cook, a 3.5kg joint will need around 3.5 hours. If you are going to finish the ham off later, remove the pan from the heat about 20 minutes before the end of the cooking time. Put it somewhere cool (not the fridge!!) so that the ham cools quickly in the liquid. Put all of the ingredients for the glaze in a small saucepan and heat until the jelly has melted. Let it bubble rapidly until the syrup has reduced by about half. You need it to be reasonably thick so that it doesn't run straight off the ham. When the ham is cool enough to touch, cut off the butcher's string and then use a sharp knife to carefully cut away the skin. Make sure you leave a generous layer of fat over the ham, and then score the fat into a diamond pattern. Spoon the spiced cranberry syrup over the Christmas Ham and then put it in the oven for 15-20 minutes until the fat is coloured. If you are doing the second stage after the ham has cooled, I would cook it for around 25 minutes on a cooler heat (180C/160Cfan/Gas4), loosely covered with foil. Then remove the foil and turn up the heat to 220C/200Cfan/Gas7 for a final 10-15 minute blast. I hope you enjoy this recipe for the Best Ever Christmas Ham as much as my family do!